John Haddon offers creative, systematic and challenging approaches which don't bypass the text but engage children with it. He analyses difficulty rather than ignoring it, marrying his own academic understanding with real sensitivity to the pupils' reactions, and providing practical solutions. Teaching Reading Shakespeare is for all training and practising secondary teachers who want to help their classes overcome the very real difficulties they experience when they have to `do' Shakespeare. confronting language difficulties, including `old words', meaning, grammar, rhetoric and allusion; reading the plays as scripts for performance at Key Stage 3 and beyond; using conversation analysis in helping to read and teach Shakespeare; reading the plays in contextual, interpretive and linguistic frameworks required by examinations at GCSE and A Level. 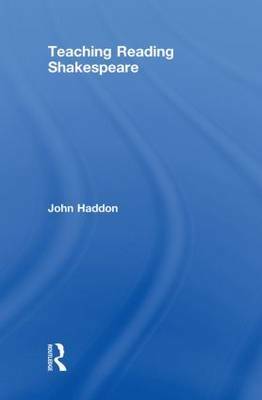 'John Haddon offers creative, systematic and challenging approaches which don't bypass the text but engage children with it. He analyses difficulty rather than ignoring it, marrying his own academic understanding with real sensitivity to the pupils' reactions, and providing practical solutions.' - Trevor Wright, Senior Lecturer in Secondary English, University of Worcester, and author of How to be a Brilliant English Teacher, also by Routledge.